The one quart M1910 aluminum canteen was the standard canteen used by the U.S. military until the early days of WW II. At that time, a shortage of aluminum, needed for aircraft, led to development of equivalent canteens based on other materials. This was the origin of the one quart canteen made of corrosion resistant steel (CRS, generally known as stainless steel). 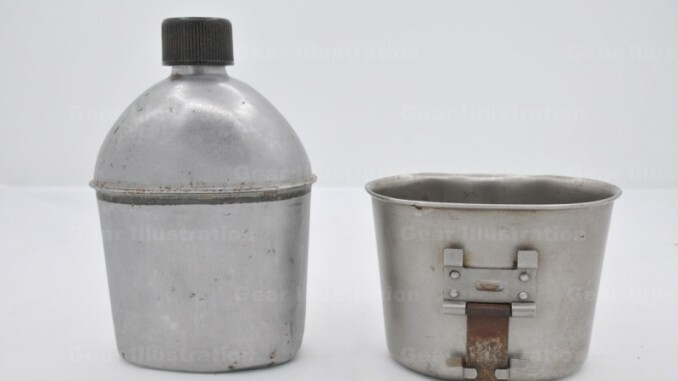 Corrosion (or corrosive) resistant steel (CRS, also called stainless steel), was used to produce canteens made from two stamped halves with a soldered horizontal joining seam, called the M-1942 or M-1910 CRS canteens. The CRS canteen was the same M-1910 design except for the material used and method of manufacture. The standard M1910 canteen cup and M1910 cotton canvas canteen carrier were used with the CRS canteens, although matching nesting CRS cups were also produced for use with the CRS canteens. The two halves of the stainless steel (CRS) canteen body were made separately, then machine pressed together at a horizontal mid-line joint, with solder run in to seal the joint. The solder contained lead which raised some concerns about possible health hazards from lead contamination, especially if acidic liquids were used in the canteen. Early production had a separate threaded neck, attached to the top half of the body in an additional production step. Later production CRS canteens have only two pieces with the neck integrated into the top body half. Other small differences appear throughout the production life cycle of the canteens. With the 1942 CRS canteens, the M1910 metal canteen cap was replaced with a black resin plastic (Bakelite) cap with a cork seal. The new cap was initially flat on top, but beginning in 1943 the cap was made with a recessed top. The M1910 aluminum canteens were once again produced after the restriction on aluminum was lifted later in 1942. Some of the CRS manufacturers also made aluminum canteens with a horizontal seam which is easy to confuse with a stainless steel canteen. Following World War II, both aluminum and corrosive resistant steel canteens continued in use but few additional CRS canteens were produced. [One example of post-war CRS M-1942 canteens is dated 1953 made by WCW.] Metal canteens were formally replaced in 1962 by the one quart olive drab polyethylene canteen but the metal canteens remained in the supply system for decades.